GLIDE’s Emerging Leaders Internship program for college students throughout the country just finished a two week in-depth immersion, where all the interns engaged in GLIDE’s many services. 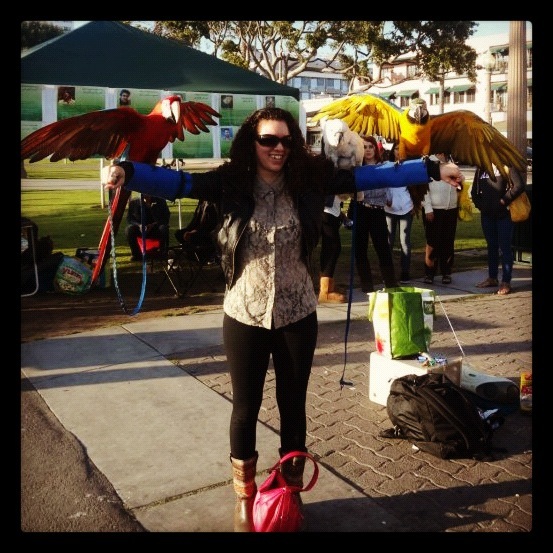 Char-Leen Craner, a junior at UC Berkeley and native to the Bay Area, shares her experience. This past spring, I was beyond excited to accept an internship with GLIDE for the summer. Family and friends showered me with advice on staying safe and questioned whether I really knew what I was getting myself into. Apparently, the Tenderloin had a bad reputation and I was going to be working right in the middle of it. These first two weeks as a GLIDE Emerging Leaders Intern have been eye-opening. I myself was raised in East Oakland, a neighborhood where experiencing drugs, violence and poverty are a normalcy in my community and even within my own life. And yet, coming to work in the Tenderloin was still a different world to me. For those who take Bart into the city, getting off at Powell Street station usually means shopping in either the Westfield Mall or Union Square. However, by just walking mere blocks the streets are no longer filled with eager teenage shoppers but instead are full of a different kind of people. Homeless. Gays. Drug users. Men and women of color alike. The outcasts and those shunned by every aspect of society seemed to mingle on the streets of the Tenderloin. 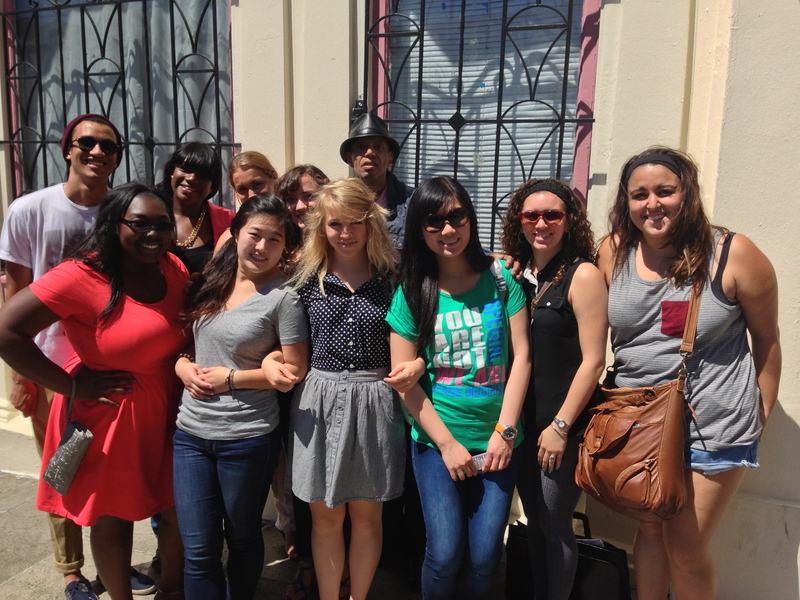 On my second week at GLIDE, the interns and I took a walking tour of the Tenderloin with Del Seymour. He took us to see St. Boniface Church, where the homeless can have a safe and quiet place to sleep, showed us a beautiful mural beneath an inner city sweatshop and even took us into a local hotel where recovering addicts stay. Having been at GLIDE for two weeks, I wasn’t expecting anything to seem different. I soon realized that while the community members we served in GLIDE embodied the Tenderloin, actually experiencing the neighborhood for itself was very different. Almost every block had something going on. I specifically remember walking down Turk street with the other interns, Del’s reminder that this was the most dangerous street in California still fresh in our minds as we hurried down the street laden with trash, dealers and users alike. Instead of rushing myself down the street and averting my eyes, I decided to look, and I mean really look, at the world around me. There were people stretched out on the sidewalk, others were sitting. Several women sat on crates; they stopped us and asked us what we were doing in the Tenderloin. A few steps ahead I noticed a drug deal between a man and a woman occur. To my right stood a man and woman sharing a crack pipe. The man was reaching out for the woman who swayed, barely keeping her balance, a look of blankness on her face that I don’t think I’ll ever forget. About a half an hour later, Del walked us back to GLIDE. Security greeted us all with friendly waves and smiles, at this point recognizing us as interns and a part of the GLIDE family. And that was when it struck me. Outside of GLIDE’s walls, was a chaotic world. At the very heart of all this poverty, violence and self-desolation was GLIDE; an oasis to those within the community. They opened their arms to the drug dealers, the addicts, those with mental disabilities, and gave them whatever they needed. Whether it was a just hot plate of food or a cry for help in recovering from drugs, GLIDE’s motto of meeting people where they were was very evident to me that day. So I must say, that while I had my own convictions of the people of the Tenderloin, I found those stereotypes quickly torn down by every person that walked into GLIDE. Regardless of what happened outside on the streets, the staff and community members treated everyone with so much respect, dignity and love – occurrences I see rarely happen in daily interactions among strangers. I have found myself overwhelmed by the generosity, strength and pure beauty of this community and I am extremely blessed to be able to work in an organization that brings so much light into people’s lives.